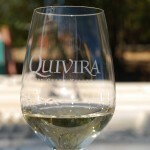 I wasn’t fortunate enough to join my fellow wine writers for the 2009 Wine Bloggers Conference, where many had the opportunity to walk the Quivira Vineyards. I was, however, fortunate enough to visit Quivira and two other wineries as part of a Visit Dry Creek series of wine segments for Daytime, a nationally syndicated morning show. We had a great time visiting Michel-Schlumberger, and then Montemaggiore, and knew that our time at Quivia would be equally as enjoyable. 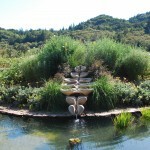 Upon arriving at Quivira Vineyards & Winery, you are greeted by a beautiful landscape, and a very serene waterfall. This sets the stage for your visit, where you’ll learn about their biodynamic farming practices, take a self guided tour through their organic garden, and of course sample their wines made from their biodynamically grown grapes. Check out the short video of my discussing Quivira and their 2007 Grenache, then continue down to more information about my visit. Though they have many wines to sample, from Sauvignon Blanc to Zinfandel, Syrah, and Mourvedre, Quivira is one of only a handful of wineries in Dry Creek making Grenache, which is why I wanted to discuss it with you. Grenache, or Garnacha as it’s called in Spain, typically has flavors of berries with a nice spicy component that lingers on the finish. As I mentioned in the video, I noticed a nice dark but still red berry bouquet and palate, and the spice on the finish was beautiful. We had some of the wine left over the next day, and it’s palate smoothed a bit, the tannins that dried my mouth during the video tasting weren’t as firm, and it was drinking wonderfully. 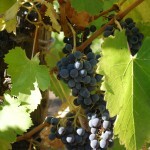 The 2007 Grenache was aged 15 months in 90% neutral oak, 10% new oak, and boasts a hefty 14.9% ABV (Alcohol by volume). In the video I mentioned the typical fatty meat pairings for this wine, as the Grenache would pair well with lamb, veal, and beef. I also wouldn’t hesitate to put this with a nice smoked or bbq rib or pork, or game birds. It’s a fairly versatile wine that doesn’t need a lot of fanfare to drink. While I believe it would benefit from some time decanting, it was quite fine right out of the bottle with no air. Winemaker Steven Cantor was more than happy to discuss not only the wines he makes, but many other thoughts on winemaking, biodynamic farming, and life. 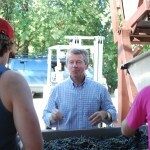 Dubbed the “Philosopher Winemaker”, it was very interesting to hear his passion for the grape, and the wines he makes. He wasn’t able to single out any one Quivira wine that he’d call his Baby, despite my proding, loving each one of them for an individual characteristic. There’s so much to see and do at Quivira, my video and post don’t scratch the surface. From their olive oils and preserves from their garden, to the farm to table dinners they do once a quarter, there’s always something new and enjoyable available at Quivira. Be sure to check out the Daytime segment which airs on Wednesday November 18th. If you can’t find Daytime in your viewing area, the segment will be online shortly at tweetmetv.com. *Disclaimer – the wine tasted in this segment was provided by Quivira during the visit. *Credit – the photo of Wine Creek in the video was ‘borrowed’ from Frank Morgan at drinkwhatyoulike.com .. hope the link back to your Quivia post makes up for that! Come back tomorrow, when we journey over the hill to Napa, and start our visit of three St. Helena wineries. Are you ready?